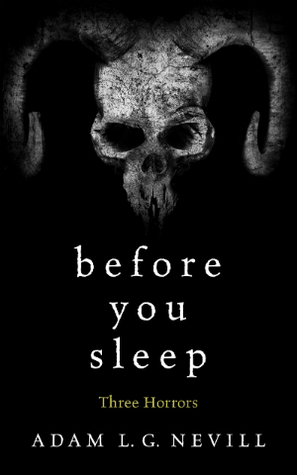 Before You Sleep is a little appetiser to Adam L.G. Nevill's debut short story collection, Some Will Not Sleep. It consists of three short tales, Where Angels Come in, Ancestors and Florrie. I've just finished reading it and now I genuinely feel really creeped out. I love reading horror but it is very rare where I actually feel disturbed or scared, unless I'm reading something written by Gary Buller. These three stories had me reaching for a stiff drink after reading. I needed to watch a disney film, go and play with some kittens and roll around in glitter just to feel ok again. I also can't help but admire Adam Nevill's genius marketing methods. As soon as I had finished this I wanted to read more. I want to read everything he's ever written. What's really odd is that I have never heard of him before, (to my shame) he clearly has an amazing talent and can actually writer stories that actually scare. Before You Sleep consists of some really intense writing, there's a real power behind his words. His is a wonderfully manipulative writer who can control all your thoughts as you read. Each word carefully placed for maximum impact. Each story will pick away at you until you want to go and hide under the bed. Out of these three stories I think my favourite would have to be Ancestors, if there's any film makers reading, this would make an excellent film! A really dark story that feels all too real. I don't want to give too much away as I don't want to ruin the experience of reading these great stories for the first time. If you want to know just how scary they are you'll have to read them for yourself! Florrie was great too, a really simple concept but beautifully executed. This one really got under my skin, both poignant and disturbing. The first tale, Where Angels Came In provided a very strong cautionary tale, curiosity really does kill the cat. So creepy too! This tale really did take me back to when I was once a young child. It's a crime every child is guilty of, trespassing onto forbidden property that adults have warned about, perhaps even running through fields of wheat!? As a child you really do feel a sense of invincibility where nothing bad can touch your life. Adam L.G. Nevill was born in Birmingham, England, in 1969 and grew up in England and New Zealand. 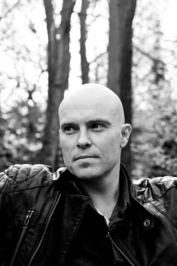 He is the author of the horror novels: 'Banquet for the Damned', 'Apartment 16', 'The Ritual', 'Last Days', 'House of Small Shadows', 'No One Gets Out Alive', 'Lost Girl', and 'Under a Watchful Eye'. His first short story collection, 'Some Will Not Sleep: Selected Horrors', is published on Halloween, 2016. His novels, 'The Ritual', 'Last Days' and 'No One Gets Out Alive' were the winners of The August Derleth Award for Best Horror Novel. 'The Ritual' and 'Last Days' were also awarded Best in Category: Horror, by R.U.S.A. Six of his novels are currently in development for film and television. Adam also offers two free books to readers of horror: 'Cries from the Crypt', downloadable from his website, and 'Before You Sleep' available from major online retailers.